On Saturday we went to a rain-drenched Oxford and had lunch at the highly recommended Branca Restaurant. Before tucking into fried calamari with lemon and chilli dressing followed by a big fat skate wing with scallops and mash, I soaked up the house red by nibbling away at some fine rosemary focaccia. So fine in fact, that I had to make some the following (rainy) day. Put the flour, sugar, salt and yeast into a large bowl. Add the olive oil then mix in enough water to make a soft dough. Knead the dough on a lightly floured surface for 5 minutes until smooth and elastic. Return the dough to the bowl whence it came, cover loosely with oiled cling film and leave in a warm place for an hour or so to double in size. Once risen knead the dough on a lightly floured surface. Then cut in two. Shape each into an oval and place on 2 greased baking sheets. 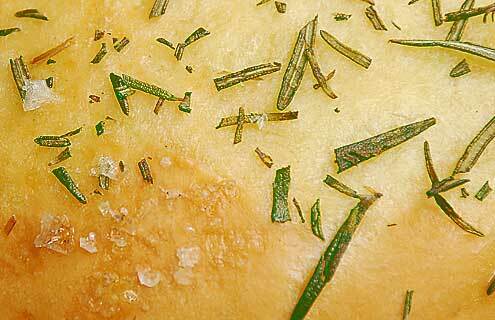 Sprinkle the loaves with the salt flakes and rosemary and leave to rise, uncovered, another hour. Drizzle with a little olive oil and bake for 15 minutes at 200C (gas mark 6). Swap the position of the loaves after 7 minutes so they cook equally. Remove from oven and pour over the remaining olive oil. Eat as soon as cool enough to handle. Verdict: An oil-infused herby treat finished with a Maldon salty crunch. Drink: K4E with UHT – Spanish style. Entertainment: Radio in the foreground, Olympics in the middleground, rain in the background. I want that bread. Such a lovely, golden colour. Oh, by the way, just to let you know, we’ve added a link to your site on ours. Thanks! This looks fabulous, and so easy! I’m definitely making this soon. Ooh! Branca was a regular haunt of mine when I lived in Oxford, as was Jericho in general, what a blast from the past! Do they still have those hands on the walls? That pleased me no end for some reason. Hands on the wall? Can’t say I saw any, but there again I was distracted by the downpour outside. By the way, we went to the covered market and bought a bottle of Baron Pougetâ€™s Original Oxford Sauce – you tried it? It’s a cross between HP and Lea and Perrings. Very spicy. Very tasty. I’ve lived in Oxford, but I’ve never eaten at Branca’s! Shame on me! 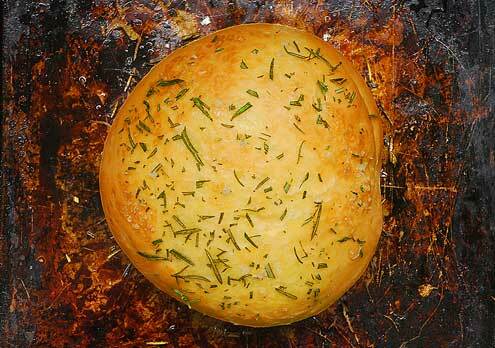 Your focaccia looks lovely. Great sammies made for lunch using this bread, slab of cold kiwi roast lamb, fresh tomatoes from the garden and a good dosing of homemade mint relish….YUMBO! Visually tempting site, delightfully inspiring images…well done!